It is 2:00pm and you can’t focus enough to get much work done. You just didn’t get enough sleep last night. So far, the workday has consisted of hiding yawns and mainlining coffee, so you don’t end up face down on your keyboard. Worse yet, you swear that it’s even harder to stay awake now than it was in the morning. If you were any more tired you’d probably fall asleep on your way to the coffee machine for your refill. All that you want to do is crawl under your desk and take a quick nap. Unfortunately, your boss checks on you periodically and he would probably fire you if he caught you napping. So, you stare at your computer screen, struggling to be productive as the minutes slowly tick away until five o’clock. Despite what your boss might think, when you are feeling tired, lethargic or run down, a short power nap might re-energize you, making you more productive the rest of the day. Napping can be healthy, beneficial and help you to get more done, not less! Is napping a sign of laziness? Despite what some people think, napping is not a sign of laziness. In fact, about half the people in the world take a nap each day, especially in warmer climates. However, in the United States, naps are considered a luxury that is only for those who have time to burn, such as infants, students or retired people. But despite that, almost everyone has the urge to take a nap in the middle of the day, even if they slept well the night before. Why do I feel tired in the mid-afternoon? Most people feel an ebb in their energy level in the middle of the afternoon. Many people attribute that to the midday heat or the eating and digesting of a big lunch. But those aren’t the two main reasons that we feel drowsy in the afternoon. The first is that our bodies experience a slight drop in temperature in mid-afternoon as a part of the body’s internal biorhythms, which seems to prepare the body for sleep. The second is that there is a rise in the body’s production of the hormone melatonin, which makes you feel sleepy. This hormone is produced by the body both at night and in the middle of the afternoon. This combination of factors results in the feeling of drowsiness that is commonly experienced by many of us in the afternoon. How can I make my naps beneficial? So, if you are feeling tired and decide to take a nap to get that energy boost, keep these 3 tips in mind when taking a nap. Nap in the mid-afternoon: The ideal nap time is from 1:00 to 3:00pm, when your body’s temperature is at its lowest and there is a rise in the production of melatonin. You want to work with your body, not against it. Naps at other times of the day aren’t as advantageous. Morning naps are mainly light sleep, while evening naps put you into a very sound, deep sleep, making you more fatigued and groggy than before. Also, afternoon naps are less likely to interfere with your nighttime sleep. Don’t substitute a nap for a full night’s rest: Naps should not substitute for sleeping well at night. However, they are a good way to re-energize yourself in the middle of the day. Keep your naps under an hour: When you nap for too long, you are more likely to go into deep sleep and wake up feeling more tired, groggy and lethargic then if you had not napped. Some experts believe a 20 minute nap session is the ideal length for feeling energized and more alert. So, make sure to set an alarm before your nap to make sure that you don’t oversleep. The ideal nap is a little different for each person, but you should fall asleep quickly and wake up a short while later feeling refreshed. If you’re feeling sleep deprived, unwell and run down, a power nap might be exactly what you need. 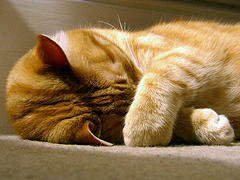 Napping will renew your energy, increase alertness, decrease fatigue and make you more productive the rest of the day. So, what are you waiting for? Don’t spend another day staring at your computer screen suffering and being unproductive. Take a nap! As long as it won’t get you fired, of course. Great post! Very timely considering I was planning this morning to look up some articles on sleep. 1. You said that in the mid-afternoon and evening there is a rise in melatonin, which makes you feel sleepy. Is this set in stone, or does it depend on your sleep schedule? For example if someone woke up at 12 in the afternoon…would their cycle be different? Do you have any thoughts on that? How I could sleep less with more energy? @Sean Here are the answers to your questions. 1. Melatonin is mostly regulated by daylight. During the shorter days of winter, melatonin production may start earlier or later. And in my understanding the production shouldn’t change as much just do to sleep schedule. 2. Some people function well on 6 or 7 hours of sleep and others like myself and you need more sleep. If there was a way to fix that, I’d be on board too. As for sources, you can look at the sleepfoundation.org, WebMD and Mayo Clinic for more information. @Maria No, you should be able to exercise just fine. I just wouldn’t recommend exercising at that time of the day due to the intensity of the sun. However, you would probably have more energy if you exercised at a different time of the day for most people. I need to put a little plug in here for my car, a Honda Element. Both passenger-side seats, front and back, fold down flat to make a bed, of sorts. When it’s not too cold out, I take naps in my car on my lunch break.